We collect and collate information about the animals, plants and fungi which are found in the islands and inshore waters to help to sustain and enhance the biodiversity of the Outer Hebrides to enrich the lives of local communities and future generations. We aim to increase our knowledge of the nature and distribution of the animals, plants and fungi of our islands and make this information freely available and accessible to everyone. We encourage everyone to take an interest in their natural world and provide opportunities to participate in biological recording. Records of fungi, lichens and slime moulds from the Outer Hebrides recorded upto 31 December 2018. Includes records collected directly from individual recorders and those collected by the Highland Biological Recording Group (HBRG). All records of insects,recorded up to 31 December 2018. 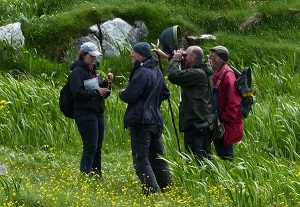 Includes records collected directly from individual recorders, as well as those collected by the Highland Biological Recording Group (HBRG), including all those held on the database at IMAG. Records of innvasive non-native species from the Outer Hebrides recorded up to 31 December 2018. Includes records collected directly from individual recorders. All records of algae and chromists from the Outer Hebrides recorded up to 31 December 2018. Includes records collected directly from individual recorders and those collected by the Highland Biological Recording Group (HBRG). Records of bryophytes submitted after November 2014 are now submitted to the NBN by the British Bryological Society. All records of otters, Lutra lutra, recorded up to 31 December 2018. Includes records collected directly from individual recorders, as well as those collected by the Highland Biological Recording Group (HBRG). All records of vertebrates (except birds, INNS and otters) from the Outer Hebrides recorded up to 31 December 2018. Includes records collected directly from individual recorders and those collected by the Highland Biological Recording Group (HBRG).